And so the field narrows. From 51 nominees for World Car of the Year awards to half that many in Car of the Year, Luxury Car, Performance Car, Green Car and Car Design categories. Four carmakers made the finals with three vehicles each – Audi, BMW, Mercedes and Toyota – with four others making the finals with two vehicles each – Jaguar, Land Rover, Mazda and Chevrolet. Jaguar, Land Rover and Mazda, along with Cadillac, also are finalists for the design award. Announcement of the finalists continues the countdown for the 2016 World Car Awards, which will be announced March 24 at the New York International Auto Show. A jury of 73 international automobile journalists selected the finalists in four categories by secret ballot, while an international panel of six design experts selected the five design finalists for consideration. Last year’s overall winner was the Mercedes-Benz C-Class. Audi A4 Sedan / Audi AV Avant, BMW X1, Hyundai Tucson, Jaguar XE, Land Rover Discovery Sport, Mazda CX-3, Mazda MX-5, Mercedes-Benz GLC, Skoda Superb and Toyota Prius. Audi Q7, BMW 7 Series, Jaguar XF, Mercedes-Benz GLE Coupe and Volvo XC90. Audi R8 Coupe, Chevrolet Camaro, Honda Civic Type R I, Mercedes-AMG C 63 Coupe and Range Rover Sport SVR. BMW 330e Plug-in-hybrid, Chevrolet Volt, Toyota Prius (Hybrid) Toyota Mirai (Hydrogen Fuel Cell) and Volkswagen Passat GTE. Cadillac CT6, Mazda CX-3, Mazda MX-5, Jaguar XE and Land Rover Discovery. 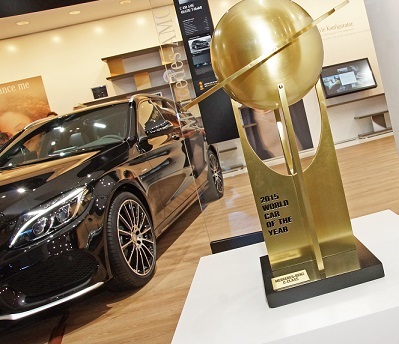 To be eligible for World Car of the Year awards, vehicles must be new and available for sale on at least two continents between Jan. 1, 2015, and May 31, 2016. Last year’s winners were the Mercedes-Benz C-Class, overall winner; Mercedes S-Class, luxury; Mercedes-AMG GT, performance; BMW i8, green, and Citroen C4 Cactus, design. This year marks the 10th anniversary of the partnership between World Car and the New York show. Besides the World Car finalists, the auto show will present nearly 1,000 of the latest cars and trucks, and more than one million visitors are expected to attend.